How about some other vegetables that may add diversity to our winter tables? I'm a maniac for celeriac; salsify would satisfy, and I'd surely swoon for cardoons. In that order. I have never loved celery, but I have a large crush on celeriac, a vegetable that may not grow well in Kentucky. So far, the growers who have tried it say it hasn't panned out. I have allowed myself one celeriac purchase this winter "from away" (Wisconsin, around 500 food-miles, purchased at Good Foods Market). How can something so ugly be so good? With that gnarly exterior hacked away, the creamy white interior slices or grates into a fresh, subtle new flavor housed in a new texture, right on the fence between crunchy and chewy. Try celeriac in the next month or so, and see whether you want to encourage your favorite farmers to try growing it. I like it best fresh, in slaw, but most cooks tout its virtues as part of mashes, gratins, or soups. The fried celeriac-potato cakes in this snazzy updated meat-n-potatoes menu also call to me. We could enjoy salsify, aka "oyster plant," in central Kentucky in winter -- that's been proven at Shakertown at Pleasant Hill. At the Trustees' Office Dining Room there, salsify from the Village garden sometimes appears in a mild, tasty casserole, something liks this, I do believe. Quite a "scalloped oyster" preparation. A bit of the botanical: the salsify plant (Tragopogon porrifolius, "Goatsbeard"), yields loooooooong white roots, while a similar plant, known as "black salsify," (Scorzonera hispanica) produces long black roots. Both apparently work well in salsify recipes. 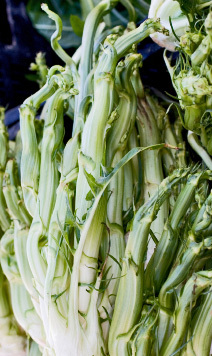 Even I have to admit that cardoons seem a stretch for the central Kentucky farmer, gardener, and cook - but don't they sound grand? Don't you get a whiff of swashbucklers, pirates, exotic Europe? Descriptions of the plant's gray-green foliage and thistly blooms add to the drama. I have to admit, a mature plant looks as it if could serve well as a horticultural barrier, grown around moats, intended to pierce intruders' blue jeans. From what I can tell, though, if any enterprising cardoon entpreneur, swashbuckling or not, grew these plants, we might eat the leaves from November through April or so. While I am dreaming of ways to diversify our local plates in winter, another recurrent dream comes up: locally grown nut and seed oils. We aren't likely to grow olives and produce olive oil in Kentucky, as far as I know, but hickory nuts and black walnuts abound. A smart young sustainability educator notes Kentucky's prolific pumpkin producers might also produce pricey pumpkin seed oil with ease. I tried pecan oil recently, and am encouraged to find it as advertised - neutral, delicious for light frying. I see from an 1855 notice in the New York Times (yes, 1855, not a typo) that others long before have thought about hickory nut oil as tasty and good for many uses. Finally, I am convinced we will soon learn that black walnuts contain some giga-super-food nutrients that will keep us young until we are 150 - and in the meantime, we could at least make and use oil from the billion-nut bounty that falls in Kentucky annually. Along with these local dishes, I'll also take a super-smug-size helping of gratification at reducing the petroleum calories required to get fresh winter food to my table. Please. Photo Credits: Dirks, Dystortia, Kameel - Thank you!